For the past few days, there has been a Batman-looking video that keeps showing up in the "related videos" sidebar. Every day, my boys are like, "BATMAN VIDEO!!!!!!!!!!" So finally I gave in and it ended up being the bomb dot com. And now, for your viewing pleasure, Vowel Bat. We watched it again today by popular demand. So today was our first official Homework Club luncheon! Due to some absences, I had 6 out of my 12 kids for lunch today. Everyone got hot lunch, which was grilled cheese, we ate Fruit Rollups for dessert, and we watched 10 minutes of Dolphin Tale. The Homework Club luncheon got RAVE reviews. I heard such comments as, "This is the best lunch ever!!!" 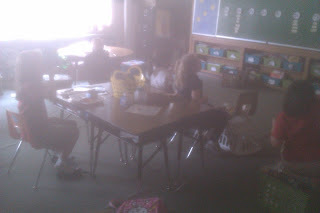 And, "I love Homework Club because we can throw away our trays whenever we want to!!!!!!!!!!!" Haha! Here is a really sunny picture of us enjoying our lunch together. Last thing - on Sunday we are having a prospective family open house. I was telling this to two of my first graders today at recess, and I asked them if they wanted more kids in our class. They said yes, and when I asked why, they told me that they would "get more candy." When I inquired further, I found that they were talking specifically about the Valentine's Day party, and that if we had more than 12 kids on Valentine's Day, they would get more Valentines and more candy. I guess that is a plus? Whoa, whoa whoa. Did I just read correctly? Do you only have 12 kids in your class? How and where do I sign up for this??? Ok, that vowel bat song is gonna be in my head for a while lol. Glad your homework club went well. I'm still thinking about how we could do something similar. I like it. Oh, dear..my boys are gonna lose their minds over Vowel Bat. LOL, love it! I can't wait to check out Vowel Bat. I bet my kids are going to looove it! Thanks for sharing! It Never Rains in Florida! You Get a Tree! And You Get a Tree! Happy Birthday to My Blog!! Where Do Teachers Go For Tips? Can We Make a Pizza With This? New Glasses and Oviraptor Eggs!